Today my husband finished replacing the steps on our front porch - and there was much rejoicing. 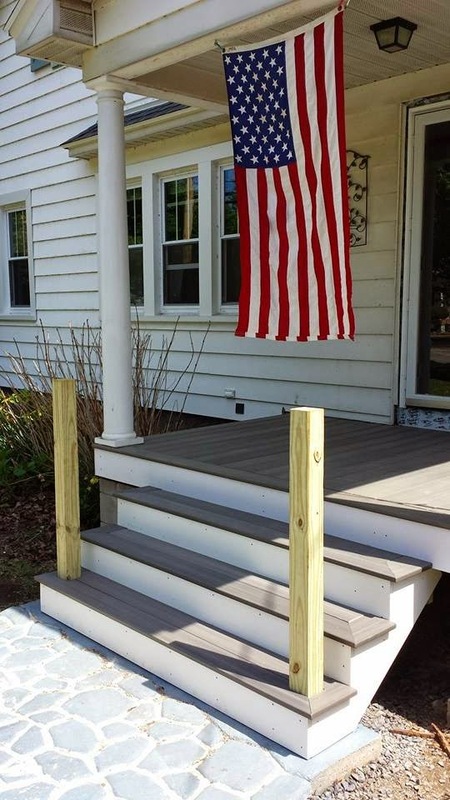 Ostensibly, this was the completion of a 2 year project - started July 2012 - when we prepared to replace the decking on our front porch, realized the porch was rotted through, and ended up tearing out the porch AND the concrete steps AND the entire front sidewalk. True to our usual style, we jumped in to DIY mode and figured it all out - or so we thought. The porch was rebuilt the first season - but we ran out of warmer temperatures here in western NY and could not pour the new concrete for the sidewalk in time... and the stairs could not be replaced until the new concrete was down. The concrete took us ALL of last summer. Granted we ran into a few snags - like the mold we used to make our cobblestone looking walkway only held 40 lbs of concrete - but the instructions had said 60 - so we had extra from every batch that had to be cast into something or thrown away (no - not that!) - so birdbaths and stepping stones and more were made... it was a slow process. And again - we ran out of good weather before we could stain and seal the concrete. Finally - this spring, after ridding the sidewalk of thousands of baby maple tress, we got it cleaned and stained and sealed - and the step replacement began. It is that during this time, hubby also replaced the front door AND installed a new lockset. See - when we purchased our house in 2001, it came complete with a gumwood door and the original 1929 lockset - which was broken. Because it was vintage - the door was cut differently than you would for a modern lockset - so it was either get that lock fixed ($$), buy another vintage lock ($$$), or replace the entire door ($$$$). We opted to keep the door deadbolted (with blue painters tape holding the latch open) and come and go through the side door - which was the cost-free option. We had never been able to use our front door as our main portal - we'd go in and out when we were home -but never had we come home and unlocked the front door to go inside. ... so today was a first. We left the house to go out for a Memorial Day picnic - exiting out the front and closing and locking it behind us - then coming home, up the steps, and opening up our front door to go inside. It felt really really really good!